If you spend any time in downtown Salt Lake City, chances are you have driven on Cesar E. Chavez Boulevard. He is known for his tireless work as an American labor and civil rights activist, as well as being a co-founder of the National Farm Workers Association. What is less known is that Dolores Huerta worked as an equal partner with Chavez in their civil rights work and the founding of the NFWA. Huerta was also a defiant feminist. She is one of the most important, yet least known, activists of our time. 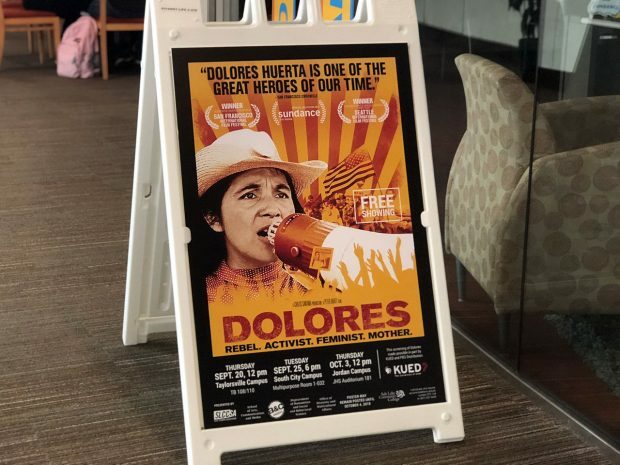 The Salt Lake Community College Student Association has been sharing her story, screening the documentary “Dolores” at several campuses in recent weeks. The documentary took home awards at both the San Francisco and Seattle Film Festivals, as well as being at Sundance in Utah. Peter Bratt decided to make a film showcasing all the good that Huerta has accomplished in her life. Bratt, along with the Public Broadcast Service, allows the audience a peek back into her extremely private life. He makes previously little-known information about her life publicly known in a way they have never been before. In the film, audiences will see interviews with Huerta’s children as well as various political activists, including Gloria Steinem, Luis Valdez, and Angela Davis. The audience gets a truly intimate look at the work of this impassioned champion for the oppressed with this inspiring portrait. Huerta was not only a dedicated civil servant, but a mother to 11 children. She enjoyed her privacy, but first and foremost, she wanted to do everything in her power to make a difference and do what she felt was right and just. The film portrays Huerta as a leader who had no problem making personal sacrifices to create social change for the good of others. The final on-campus screening of “Dolores” is scheduled for noon Oct. 3 in the JHS auditorium at Jordan Campus. The event is free.